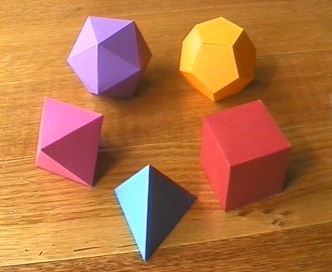 The Platonic solids are the five convex regular polyhedra. Each one has identical regular faces, and identical regular vertex figures. With Great or Small Stella, or Stella4D, when a net doesn't take up the whole page, you can put the paper back in the printer and tell it to start printing the next nets part way down the page (from where it left off). This helps you save paper, which is especially handy for these simpler polyhedra. These models were made using nets generated by Great Stella, but could also be made using Small Stella or Stella4D. Click on the images below to see a bigger picture and get more information about them. Stella4D, Great Stella and Small Stella all let you map images onto faces of polyhedra, and here are some examples. 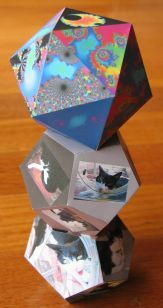 See the dodecahedron and icosahedron pages for individual photos of these models.